An exciting opportunity to be featured in Forbes was on the horizon, and the publication date was just 2 months away when Steve DiGregorio, President and Sr. Portfolio Manager at Compass Asset Management Group, first contacted us. He needed a new custom website for his business, and he needed it fast. Our recommendation (with time ticking away! ): the best plan of attack was to develop a one-page website which still addressed all the important information a potential client would need to know: a little about Compass, the services they offer, information about the team, and of course contact details. Once the deadline for launch was met, we knew we could build on the one-page website, if it was desired in the long run. Steve also already had a library of blog postings on his current site which we would bring over to the new site, and would be the only additional pages on the site. The advantage to a one-page website: brevity, which, these days, is what every consumer is looking for anyway. We didn’t have to spend weeks developing content for the sections. Our goal was to get to the point quickly, creatively, and in the same professional and friendly manner that Steve likes to run his business. 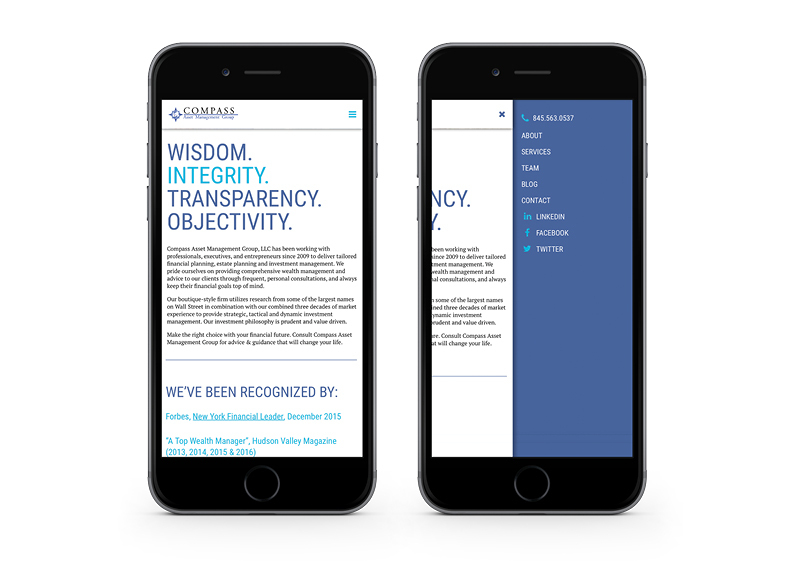 Steve provided us with enough background information and content that we were able to take that and mold it into fresh headlines and copy that succinctly tell the story of Compass Asset Management Group. Steve’s goals for the new site included creating trust, depth, and to not have a small-shop feel. The site needed to compete with the big guns, while being a boutique-style investment firm. 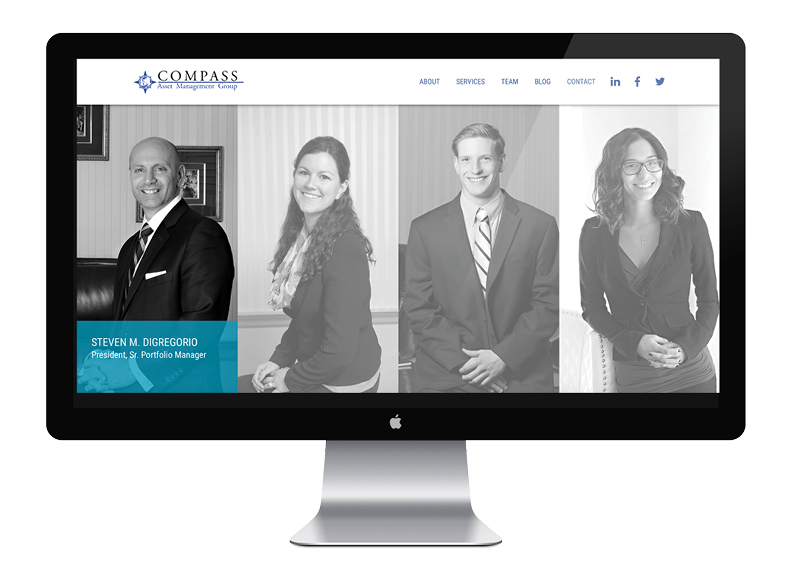 Compass offers personalized investment management, and the site needed to show that they are very individually-focused, with a wealth of experience behind them. Through every step of the design process, we considered how the site would work on mobile devices, as well as load-times and user experience. We helped to find imagery that would set the right tone for Compass from the first time you load the site. In the end, the site was successfully launched just prior to the Forbes publication date. Compass Asset Management Group is continuing to work with Katy Dwyer Design in site management and consultation.